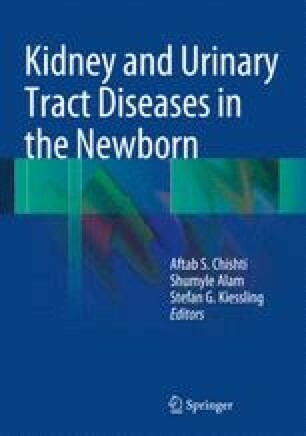 Peritoneal dialysis (PD) has long been considered an effective treatment modality for neonates with severe acute kidney injury (AKI) and is the modality of choice when treating neonates with end-stage renal disease (ESRD) needing chronic renal replacement therapy. Its popularity and success largely derive from its simplicity and effectiveness as a means of removing solute and fluid in even the smallest patients. In its most basic terms, the removal of plasma solutes (solute clearance) is achieved by diffusion of the solute down a concentration gradient between dialysate and blood and across the semipermeable peritoneal membrane. Fluid removal (ultrafiltration) is achieved by the osmolarity of the dialysate creating an osmotic gradient along which fluid moves across the membrane and is drained from the patient. Access for PD can be achieved easily and even emergently in the unstable patient with AKI at the bedside, and the continuous and gradual provision of both solute clearance and ultrafiltration aims to mimic the function of the native kidney.